If you’re looking to buy a home, or to sell the one you own, it’s important to be aware of the existence of a colorless, odorless, and tasteless gas called radon. The (very) bad news about radon is that it’s radioactive and causes thousands of lung cancer deaths in the U.S. each year—a 2003 EPA Assessment of Risks from Radon in Homes found that it killed 21,000 people that year. That’s more than the 17,400 people killed by drunk driving. Only smoking causes more lung cancer deaths than this gas. The somewhat better news is that radon mitigation is not expensive—so you have no excuse not to get a radon inspection of your home. Radon kills – and it’s everywhere! Radon is found all over the United States, in the soil and in water supplies and radon testing has revealed its presence in all 50 states. Since it’s impossible to detect by human senses, the gas can easily enter any kind of building. According to current EPA estimates, 1 in every 15 U.S. homes have excessively high radon levels. This is why the EPA and the U.S. Surgeon General recommend radon mitigation in all homes below the third floor, as well as in schools. Testing your home for the presence of radon is inexpensive and usually only takes a few minutes of your time. A good radon mitigation system can reduce gas levels by up to 99% and even very high levels can be driven down. Furthermore, new homes can be built radon-resistant, which makes it easier to reduce levels below the 4 pCi/L (picocuries per liter of air) breaking point during occupancy. If you’re just interested in radon test kits (and you should be!) for the safety of your own home, you’ll be happy to learn that you can mail order low-cost, DYI solutions, or buy them at several hardware stores and supermarkets across the country. If you’re selling or buying a home, you’ll require a certified radon tester, who will perform an inspection of the home in question. Start out by contacting your state’s dedicated radon office to ask for a list of their names. When it comes to testing, there are two methods you can employ: short-term and long-term testing. Find out how they work and how to administer them right below. This is the quickest kind of test you can have, and while it won’t produce an accurate year-round average of radon levels in your home, it’s a good method for whenever you need rapid results. Such systems need to be in your home or 2 to 90 days. The most frequently used methods involve charcoal canisters, electret ion chambers, charcoal liquid scintillation, continuous monitors, and alpha tracks. This type of test requires more than 90 days, since radon levels fluctuate seasonally. The most common methods are electret and alpha track-based. The most important thing to bear in mind, when performing a short-term test is to allow as little air to come in from the outside as possible. Close all windows and doors, turn off ventilation systems that bring in air from outside, and make sure to do all this at least 12 hours before the test. You may run small exhaust fans or radon reduction fans and you must remember that tests conducted in very windy weather will be inconclusive. 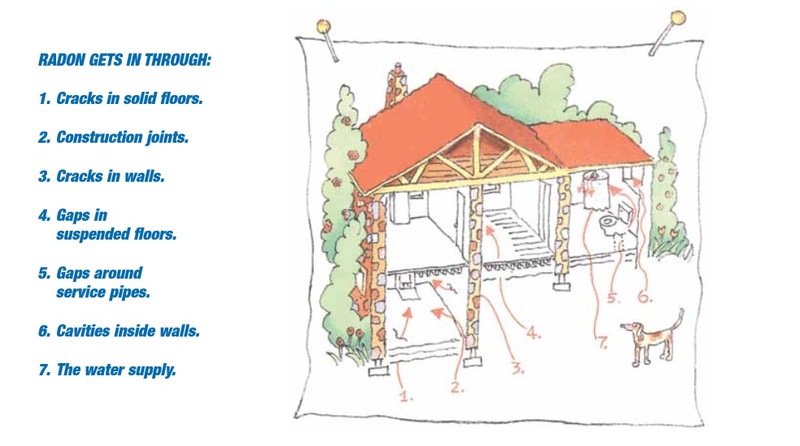 Place the test in the lowest inhabited level of the house, at a minimum of 20 inches above the floor, away from drafts, heat, moisture, and outside walls. Once the test is finished, reseal the package, and send it to your local lab for testing. Don’t place tests in the kitchen or bathroom. Nowadays, more and more prospective home buyers want to know if the home they’re interested in has been tested for radon. Bear in mind that landlords who own rental property may not test the home themselves if it is for sale. More often than not, a potential buyer will want to know if the inspection was performed by an independent party, not involved in the sale. As such, you’ll need to work with a certified provider of radon inspection services or, at the very least, run two short-term tests side by side, placed at a minimum distance of 4 inches. It’s also important to know that buyers might want non-inhabited areas (like the basement) to also be tested. The best way to save yourself some trouble at the time of the sale is to get your home periodically tested on a regular basis. For more useful information on radon mitigation, check out this handy Citizen’s Guide from the U.S. government Environmental Protection Agency (EPA).